In a large slow cooker, combine onions, garlic, paprika and oregano; stir until well mixed. Heat oil in a skillet over medium high heat. Add half of the chicken thighs and cook for 4 minutes or until browned. Turn thighs over and cook for another 4 minutes or until browned. Transfer to slow cooker. Repeat with remaining thighs. Stir together tomatoes, juice, and tomato paste; pour over chicken thighs. Cook for 8 hours on low. Remove chicken thighs from the slow cooker and keep them warm. Add sour cream to slow cooker and stir until cream is warm. 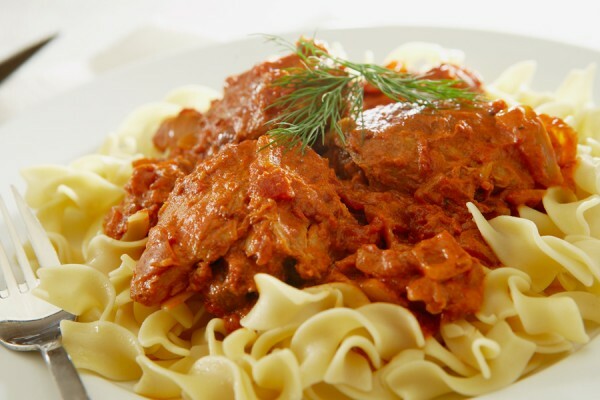 Serve chicken and sauce with hot cooked egg noodles.